The tree is tall and stately, 9-20 m tall, with evergreen, alternate, glossy, leathery leaves to 22 cm long and oval. All parts contain a sticky, white latex. Short stout flowering twigs emerge from the trunk and large branches, or even from the soil-covered base of very old trees. The tree is monoecious: tiny male flowers are borne in oblong clusters 5-10 cm in length; the female flower clusters are elliptic or rounded. Largest of all tree-borne fruits, the jackfruit may be 20-90 cm long and 15-50 cm wide, and the weight ranges from 4.5 to 50 kg. The 'rind' or exterior of the compound or aggregate fruit is green or yellow when ripe and composed of numerous hard, cone-like points attached to a thick and rubbery, pale yellow or whitish wall. The interior consists of large 'bulbs' of yellow, banana-flavoured flesh and a central pithy core. Each bulb encloses a smooth, oval, light-brown 'seed' (endocarp) covered by a thin white membrane (exocarp). 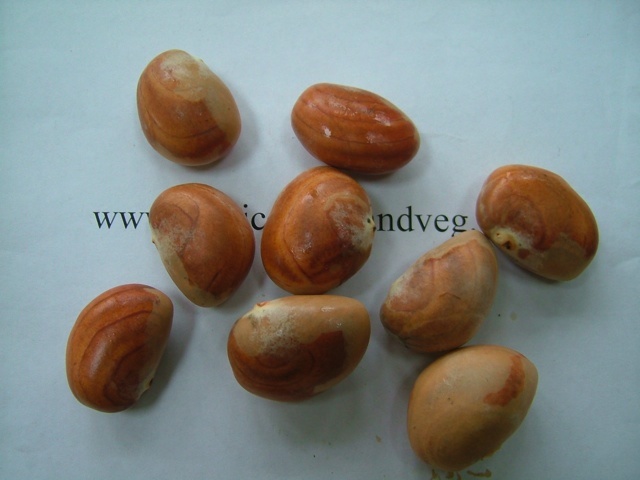 Jackfruit seeds are 2-4 cm long and 1.25-2 cm thick and is white and crisp within. 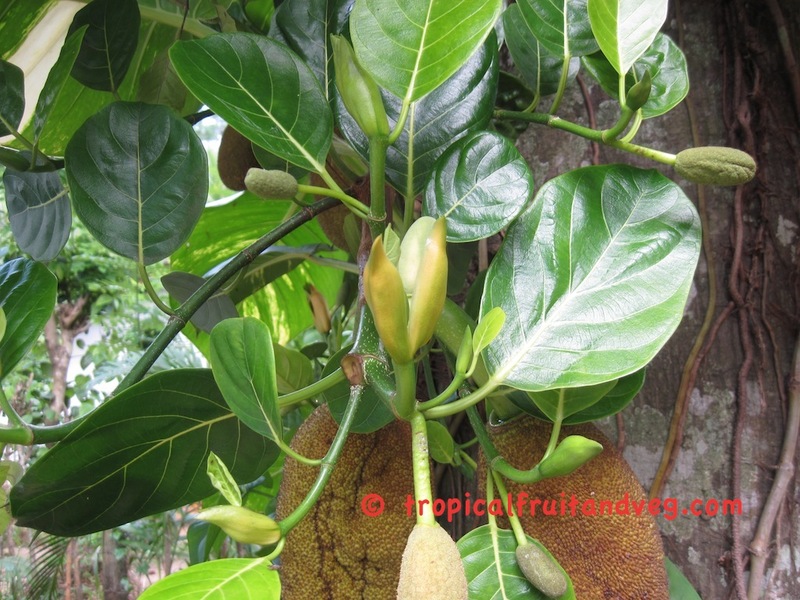 There may be up to 100 seeds in a single fruit. 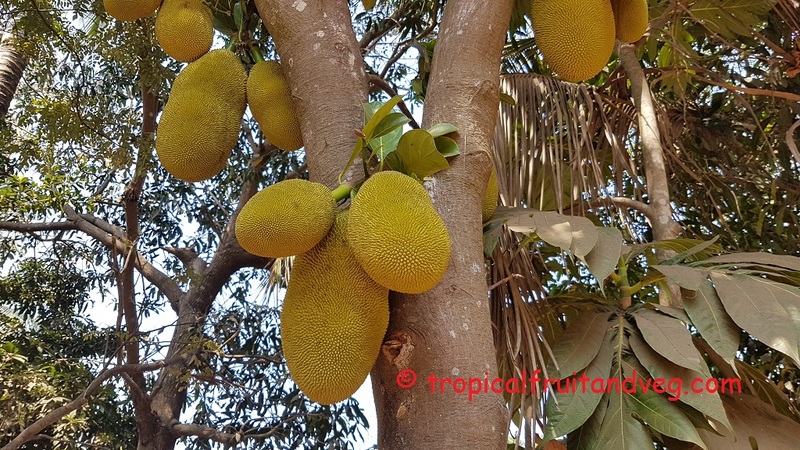 When fully ripe, the unopened jackfruit emits a strong disagreeable odour, resembling that of decayed onions, while the pulp of the opened fruit smells of pineapple and banana. 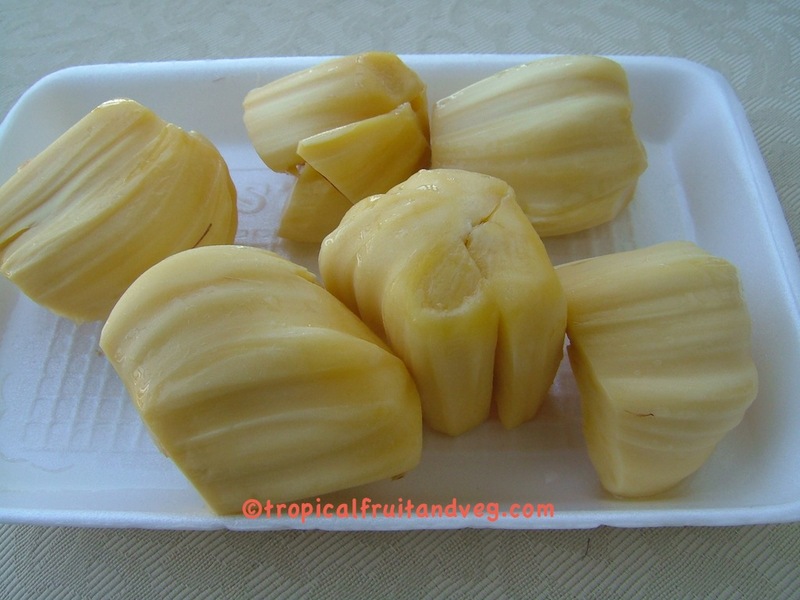 The Chinese consider jackfruit pulp and seeds tonic, cooling and nutritious, and as a cure for a hangover. The seed starch is given to relieve biliousness and the roasted seeds are regarded as aphrodisiac. The ash of jackfruit leaves, burned with corn and coconut shells, is used alone or mixed with coconut oil to heal ulcers. 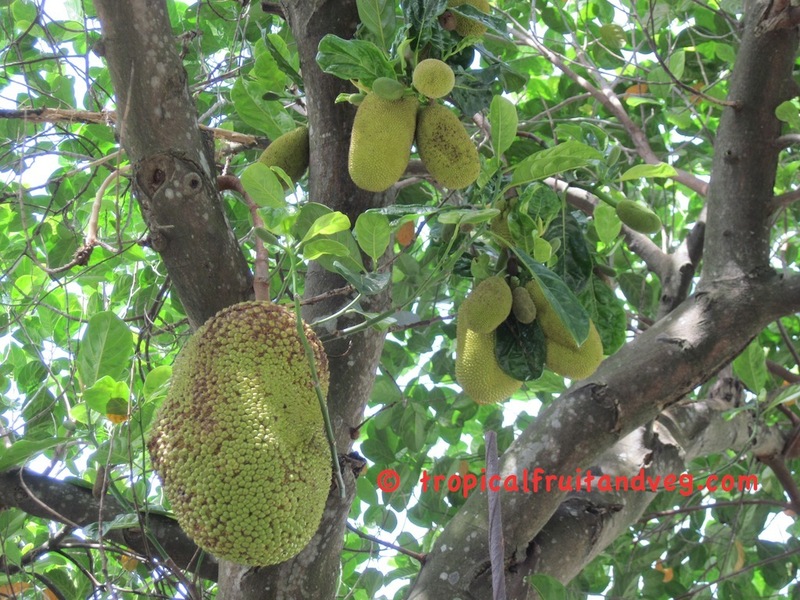 The jackfruit is adapted only to humid tropical and near-tropical climates. 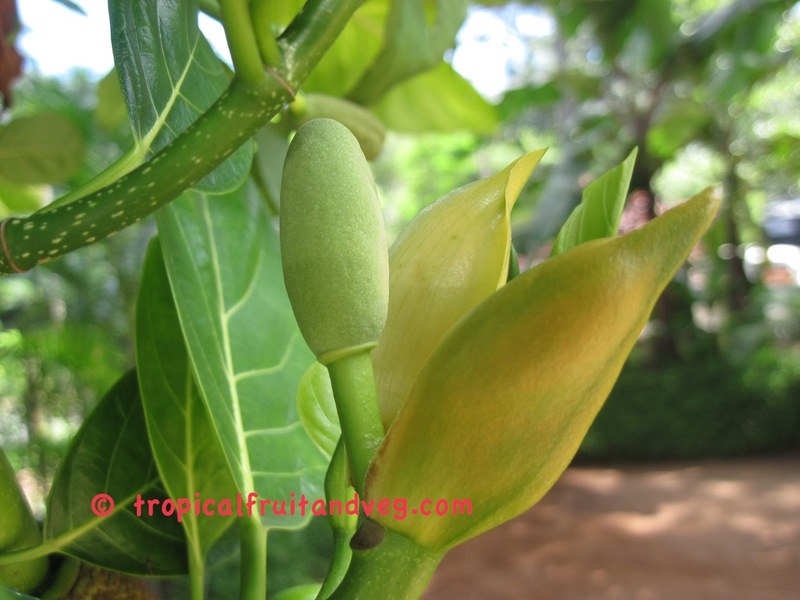 It is sensitive to frost in its early life and cannot tolerate drought. If rainfall is deficient, the tree must be irrigated. 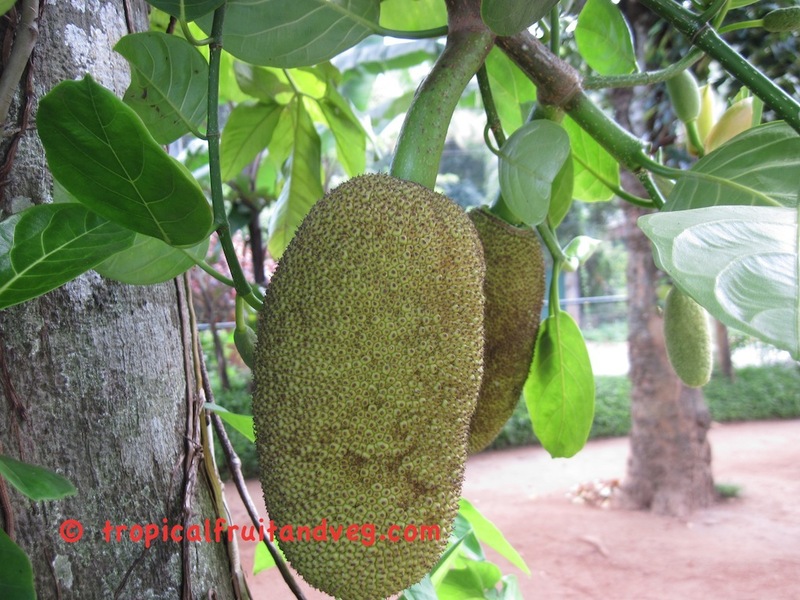 The jackfruit tree flourishes in rich, deep soil of medium or open texture, sometimes on deep gravelly or laterite soil. It will grow, but more slowly and not as tall in shallow limestone. The tree grows tall and thin on sand, short and thick on stony land. It needs very good drainage. Propagation is usually by seeds which can be kept no longer than a month before planting. Germination requires 3 to 8 weeks but is expedited by soaking seeds in water for 24 hours.